I've often heard people complain that seafood is too expensive, and that they consider it a luxury. Research has shown that when general grocery prices rise, consumers often will purchase less seafood, considering it an easy sacrifice. It is mainly during some holidays where consumers might be willing to splurge on expensive seafood. But, consumers have some misconceptions in this area, and should view seafood more as a necessity rather than a luxury. As I've mentioned before, according to the Centers for Disease Control & Prevention (CDC), the leading cause of death in the U.S. is heart disease, killing over 614,000 people each year, comprising about 1 in 4 deaths. That is a staggering statistic and should make all of us concerned about our own health risk. It may not gain as much publicity as other causes of death but it is one which is most likely to touch all of us is some way. I'm sure we all have had family and friends who have died from heart disease, and we should be doing what we can to reduce our own chances of acquiring heart disease. Seafood consumption is a significant key to reducing your chances of heart disease. Since the 1970s, over 20,000 research studies have been conducted on the health benefits of seafood and they have concluded that eating seafood twice a week can reduce your chance of dying from heart disease by about 36%. You won't find another single food that has been scientifically proven to reduce heart disease so much. Low seafood consumption is blamed for approximately 84,000 deaths in the U.S. and 1.4 million globally. Besides helping to reduce heart disease, research has also been providing growing evidence of the health benefits to the brain and bones as well as against cancers and inflammatory diseases. Eating more seafood is such a simple change to your lifestyle and it can bring so many health benefits. The scientific community advises people that they should eat seafood twice a week, an annual consumption of 26 pounds of seafood. However, most Americans significantly fail to meet this standard. In the last 18 years, the highest annual seafood consumption was in 2005 with 16.6 pounds, dropping to a low of 14.4 pounds in 2012. In 2014, there was a tiny increase, to 14.6 pounds, but the best news came in 2015 when annual consumption actually increased nearly a pound to 15.5 pounds. The trend ended in 2016, when consumption decreased to 14.9 pounds. The numbers for 2017 probably won't be released until the fall. In general, Americans are falling short of the USDA seafood consumption recommendations by more than 10 pounds. They are failing to garner the maximum health benefits from seafood consumption, failing to reduce their chances of heart disease by as much as they could. Isn't your health worth the price of buying and consuming seafood? Do you think your health is a luxury? There are ways to find better values in seafood, though it might also take a bit more effort on your part. First, you can find some seafood which is much more affordable, such as mussels, which are delicious, easy to prepare and very nutritious. Second, seek out local seafood as it often can be less expensive than imported seafood. You can visit some of the local fish markets in the fishing communities such as Gloucester or New Bedford. Third, buy seasonal seafood as it is usually less expensive because it is more abundant in season. If you buy fish out of season, the price may have a premium added to it. Fourth, check out some of the less popular fish species, which may be cheaper because there is less demand for it. Try wild drum fish, snook, or cobia rather than tuna and cod. These offbeat fish can still be quite tasty and it helps you expand your palate as well. Fifth, if you purchase a fish whole, you can also save money than if you just bought fillets. But, you really only gain savings if you know how to properly cut and slice up a whole fish. That does take some skill but you can find some good books to help you in that regard, or try taking a cooking class on fish preparation. If you are clueless, then buying a whole fish won't end up being less expensive. You should also use all of the whole fish, from head to bones, to extend the value of the fish. Take the time to learn these skills and your seafood will be much cheaper. Sixth, consider eating smaller portions of fish, rather than a large fillet or steak at one sitting. Even if the seafood is more expensive than other proteins, just manage your portion size so it becomes more affordable per serving. Most doctors would recommend reducing portion sizes of most proteins so reducing your seafood portions shouldn't be a significant problem. Find ways to eat more seafood, despite the financial cost, as the health benefits far outweigh the other costs. And the potential financial costs of treating heart disease can be quite high so spending much less money to eat seafood is basic good sense. Most Americans probably don't understand the underlying meaning behind Cinco de Mayo in Mexico, but it has taken on a new meaning in the U.S., becoming more of a day to celebrate Mexican culture. For some, it is merely an opportunity to consume lots of tequila and tacos while for others it can be a learning experience about another culture. It is a time when Americans should be respectful of Mexican culture. Committee, one of my favorite restaurants, is honoring Cinco de Mayo with a special menu, created by Chef Theo Tsilpanos and his talented team, that fuses Greek and Mexican cuisines. This menu will only be available for five days, from Tuesday, May 1 through Saturday, May 5, during dinner service. "Fusing the two cuisines is a new trend that is starting to pop up around the country, most recently with fast casual Souvla and Tacolicious in San Francisco teaming up to create Souvalicious Lam mole tacos earlier this month." The full menu is below and all items are available a la carte. This menu will be offerred in addition to the regular menu. I think these fusion dishes sound delicious and innovative. And as Committee is consistently excellent, I expect these dishes will meet that same standard. I recommend you make a reservation for Committee and don't miss out on this special menu. 1) Puritan & Company has announced that beginning May 4, it will begin operating the culinary events and weddings at The Herb Lyceum in Groton. A subsidiary of Puritan & Company, Puritan Events Co., will be responsible for all weddings, special events, retreats and monthly farm dinners at The Herb Lyceum. Each week starting on May 4th, The Herb Lyceum will host their very popular Farm Dinners on select Fridays and Saturdays throughout the summer season. Arrival time for The Herb Lyceum Farm Dinners is 6:30pm with hors d’ oeuvres served outside, weather permitting, and dinner starting at 7:00pm. The farm dinners feature five-courses for $75 per person, which includes gratuity. The dinners are BYOB and guests are invited to explore the farm, dine at a communal table and enjoy farm-centric seasonal cuisine created by the talented team behind Cambridge’s Puritan & Company which is led by Chef/Partner Will Gilson. The menus are posted monthly online and bookings, along with the scheduled dinner dates, can be found by logging onto The Herb Lyceum. For the BYOB dinners, Puritan & Company’s expert sommelier Peter Nelson will carefully curate wine tasting notes to complement each course for guests to purchase some of the selections and bring with them for the dinner. Dietary restrictions for each menu can be accommodated with advance notice. The Herb Lyceum is also the perfect spot for one-of-a-kind weddings, unconventional corporate retreats and picturesque private events throughout the season. The special events manager and wedding planner is Rebecca Millette who can customize each event to fit every guests’ unique needs. She can be contacted at Rebecca@herblyceum.com. 2) Cambridge Center for Adult Education is hosting its first ever Oysters, Of Course! event on Thursday, May 31, 5:30pm-8:00pm to celebrate summer and showcase some local chefs and oysters. The event is a benefit for the Cambridge Center for Adult Education (CCAE), one of the country’s most acclaimed education non-profits which sets the standard for community-based experiential learning. With a vibrant program of cooking & wine, visual arts, world languages and ESL, business, life & wellness classes and more, there is always something to learn and experience at the CCAE. Located in the heart of Harvard Square, CCAE creates educational opportunities that are interactive and inspirational. Chefs Tony Maws and Michael Scelfo will be on hand, as will Island Creek Oysters, Les Sablons, Parsnip Restaurant, Beat Brasserie, The Hourly Oyster House, Honeycomb Creamery, Hooked Fish Shop and more. Wine and Beer sponsors include Salt and Olive, Cambridge Brewing Co. and 90+ Cellars. Oyster demonstrations and discussions will be led by the Massachusetts Oyster Project. Please consider “shelling out” for an individual sponsorship! 3) On Wednesday, May 2nd, at 5:30 p.m., SRV’s co-executive chefs Kevin O’Donnell and Michael Lombardi will continue their cicchetti takeover series with guest chef, Chef Colin Lynch of Bar Mezzana. Guests will be treated to Lynch's spin on cicchetti (or Italian small bites,) which will be served up complimentary in SRV’s sleek bar and bacaro area of the restaurant where guests can pair their gratis bites with Italian-inspired cocktails, amaro or a variety of wine by the glass and bottle. The complimentary cicchetti will be available until supplies last. "The Ba’al Shem Tov tries to impress on a simpleton the value of a bagel. It is of such worth, he says, that even a non-Jew will help you if you throw him a bagel." What is the origin of the bagel? When did it first come to the U.S.? During the last 100 years, what have been some of the highlights of the history of bagels? Maybe the most definitive history is The Bagel: The Surprising History of a Modest Bread by Maria Balinska. Though small, the book contains plenty of fascinating information on the bagel's history, as well as dispelling some of the myths around the bagel's origins. In addition, the book provides some information on the bagel's place in the U.S., primarily New York, during the 20th century. I wanted to add some additional information, which I've garnered from various newspaper archives, and that paint a fuller picture of the bagel's place in the U.S. Please note that my additions cover the time period of 1935-1974. Additional research is certainly warranted and I may expand upon this article in the future. As a start, let's begin with a brief summary of the bagel's origins as provided by Ms. Balinksa. The first document that referenced a bagel was in Kraków in 1610, a sumptuary law concerning the celebrations surrounding the circumcision of a baby boy. Ms. Balinska also writes that, "Jewish documents and expert opinion concurs that the word bagel comes from the Yiddish beigen, to bend, which in turn is related to bouc, the word with the same meaning in Middle High German." We can't be sure when the bagel first came to the U.S. but Balinska believes it was most likely during a large wave of Jewish immigration from 1881-1914. About the same time as a bagel tradition began in New York, one also began in Montreal, though both areas would eventually become known for their own different style of bagel. Today, both bagel styles have their own fervent advocates. For example, Joan Nathan, author of the King Solomon's Table: A Culinary Exploration of Jewish Cooking From Around The World, wrote that, "... a Montreal-style bagel--thinner and smaller, but with salt and less sweetness. This "new" style of bagel is what bagels uses to be like. The water may not be New York's, but I argue that the bagels as just as good, and maybe even better." It is intriguing that in the U.S., bagels are commonly restricted to breakfast or brunch, especially on Sundays. During my search of newspaper archives from the 1930s-1970s, I found many references to lox and bagel brunches. I failed to see anyone hosting a bagel dinner. However, Baliska mentioned that back in Europe, "Bagels were popular tavern fare. Jewish immigrants to the United States recall parents making bagels to be served at the inn: ‘An onion, schnapps and a bagel’ would have been a typical order." Have you ever seen an American bar or tavern that served bagels? Would you order a bagel with a cocktail, a glass of wine, or a beer? I am very curious as to why this tradition didn't carry over to the U.S. What occurred to transform this tavern fare into breakfast fare? During my research, the first newspaper reference I located was in The Jewish Criterion (December 26, 1930), which mentions the Caplan Baking Company, in their 50th year of business. They bake items including bagel, rye bread, chaos, cakes, and matzos. The article continues to state that their products will now be available at Klein's Delicatessan and Restaurant. The next newspaper reference I located was the Journal News (May 16, 1935--New York), a brief article about a lawsuit involving a bagel. The article stated, "A "bagel" was the bone of contention in County Court at New City this morning in a suit brought by Alexander Green of Spring Valley against Mager and Thorn, et al., a New York City baking firm. "Bagel" it developed, is a type of Jewish roll and Green sued for $3,000 for injuries alleged to have been received when he ate a bagel." Unfortunately, few details are provided and it didn't describe the nature of the injury. However, the article did mention that the defendants denied making the bagel and the parties eventually agreed to discontinue the case. This article does seems to indicate that non-Jewish readers weren't yet familiar with the bagel and needed an explanation of the term. The next reference I found also involved a legal matter involving bagels. In the Brooklyn Daily Eagle (October 22, 1936) there was an article titled, Suspect Arraigned In Jewish Roll Theft. A man was charged with petty larceny, accused of stealing a dozen bagels every day for two weeks. the alleged thief was tracked down to a dairy store, where he was trying to sell the bagels. The article states a bagel is a "Jewish roll," which again seems to indicate non-Jewish people weren't familiar with the bagel at this time. Most of the subsequent newspaper articles I found were from a single source, the Jewish Post, an Indianapolis newspaper. On July 9, 1937, they had an ad for Shapiro's Delicatessan, mentioning they carry "bagel rolls." There was another ad in the July 28, 1939 issue for the South Side Baking Co., detailing which stores carried their "Bagel." This usage seems to indicate that the plural form of bagel is simply bagel. Additional articles I found also supported this same bagel usage, choosing not to add an "s" to the end of the word. The June 12, 1942 issue of Jewish Post discussed a buffet offered at a USO club, which was attended by a new army division, composed primarily of "Indians." One of them wanted a fish sandwich and was given lox on a bagel. He didn't know what lox was but must have enjoyed it as he came back the next day for more lox. On November 8, 1946, the Jewish Post reported the local bagel bakers were on strike, but no details were given. Ms. Baliska wrote about the New York Bagel Bakers Union, Local 338 of the Bakery and Confectionery Workers’ International, which was founded in 1937 and dominated bagel production until the late 1960s. As she wrote, "The 1950s would see the high point in the union’s fortunes, an extraordinary time when it was impossible to sell a bagel in New York City without their say-so." A new Jewish cookbook was highlighted in the Jewish Post (January 20, 1950). Jewish Cookery, by Leah W. IV. Pearlroth Leonard (previously the food columnist for The Post), is a 500 page tome, broken down into 35 chapters. The article states, "Mrs. Leonard, in her chapter on bread, writes sadly of the fast-disappearing art of bagel-making in America. She includes a recipe for these water doughnuts, which she insists are typically Jewish as gefilte fish "exacted from a retired baker, who learned the art in Europe and practiced it in one of our large cities for more than 40 years.” She tested it successfully, in spite of the baker’s warning that it could not possibly be done at home. Get a copy of "Jewish Cookery,” and bake yourself a batch of bagel." First, I love the description of bagels as "water doughnuts." Second, home cooks once made bagels at home? Do you know anyone who makes their own bagels? This article wouldn't be the only one to raise the issue of making bagels at home. I hadn't previously heard of a difference between Western and Eastern bagels. The Jewish Post (March 23, 1951) though reported on them, "The difference between Western bagels and Eastern bagels caused a minor crisis on the set of Warner Bros. 'Tomorrow is Another Day.' Director Felix Feist discovered that the bagel-peddlers cart in a New York street was loaded with Western-type bagels--i.e. small and donut shaped. He insisted on the Eastern type--i.e. larger and pretzel shaped. The property master finally hustled up some of the Eastern bagels from a delicatessen on Los Angeles' Brooklyn Avenue." Returning to the subject of bagel strikes, the Breckenridge American (December 27, 1953) reported on a strike by 45 truck drivers, who delivered bagels to restaurants and neighborhood stores, which lasted for about 32 days. A settlement was eventually reached so the bagel famine ended. This story was also reported in a California newspaper and they needed to write a follow-up article to explain the nature of the bagel. In a sports column of the Madera Daily News Tribune (December 31, 1953), they published an article titled, "Bagel is Explained." One of their readers wanted an explanation of the bagel and the article stated, "A bagel has been jocularly, but nevertheless somewhat accurately, described as a hardboiled doughnut. But unlike the doughnut it is (1) not sweet (2) not fried, but baked (3) not soft. About all it shares with the doughnut is its shape." The article continues, "It is a breakfast favorite of many a New Yorker, particularly those who have been exposed to the eating habits of the Yiddish population of the city; for a breakfast of lox (smoked salmon), cream cheese, and half-and-half (weak coffee halved with cream) is very often favored by Jewish folk." And it also states, "Dipped in coffee, its lobster-like outer shell becomes amenable to the dental onslaught of its devourer. Smeared with sweet-butter, after having been sliced across, it becomes a rare delicacy; garnished with fresh cream cheese, it is a delight; and if the salt, sweet flavor of smoked salmon is added (as the famous Lindy's restaurant serves it) the bagel becomes the center around which a whole breakfast may be built." Why would a bagel article be presented in a sports column? The article address that question, "Many an earnest eastern lad grappling with the lower rungs of the ladder to fistic prominence has subsisted almost entirely on the bagel. Like Benjamin Franklin’s two-penny rolls, the bagel is a classic, inexpensive way to fill the void beneath the manly chest." The answer continues, "But the bagel for a long time was the stuff of which fighters were made ... at least in the early mornings of the early days of their careers." Boxing and bagels! Did you ever hear about canned bagels? In The Brooklyn Daily Eagle (December 29, 1954), there is an article highlighting Israel Hershman, the owner of the Coney Island Bagel Bakery, who is supposed to be a master at creating bagels. As the article states, "Bagels, allow me to instruct you, are created, not manufactured. Each one is fashioned by the touch of a skilled hand." Hershman creates some bagels which will be canned, something new in bagel packaging. The bagels need to be created at the proper size so they fit within the can. Hershman has shipped these canned bagels to places including Rome and Israel. Who would have thought? Bagel Pizza? The Ohio Jewish Chronicle (February 11, 1955) had an advertisement for Max's 21 Restaurant & Delicatessen which mentions "Max's First Bagel Pizza" though no further description is provided. A competing Bagel pizza? The Ohio Jewish Chronicle (June 22, 1956) presented an advertisement for Johnny's Pizza which also offers a Bagel Pizza, in 9 varieties. Again though, there are no further details. The Jewish Post (February 1, 1957) returned to the idea of making bagels at home, providing a complete recipe for the home cook. The ingredients list included: 3 cups all-purpose flour, plus 3 tblsps. for kneading board; 1 1/2 tsps. salt; 2 tblsps. sugar; 1 pkg. yeast; 2/3 cup warm water; 3 tblsps. oil or shortening; 1 egg; and 4 quarts boiling water, to which add 2 tblsps. sugar. The instructions include boiling and baking the bagel. There are additional references to various bagel types such as the Jewish Post (February 14, 1958) which had an advertisement for a New York deli which sold a "New York Water and Pumpernickel Bagel." Ms. Baliska also mentioned in her book that during the mid-1950s, you could find Cinnamon Raisin and Onion bagels. Technology surfaced to make bagel-slicing more sage. The Jewish Post (June 20, 1958) reported on a new bagel holder, created by a Miami plastics company. The article states, "The instrument has six sharp teeth on each side, to hold bagel firmly, and its use insures equal bagel halves for toasting,..." Now, you'll hear some people say you should never toast a bagel but prior to the 1960s, toasting bagels was very common, even in New York. Why was that so? Prior to the 1960s, Ms. Balinska wrote that "...the cellar bakeries had sold their bagels wholesale to delicatessens, supermarkets and other bakeries." So, when a customer purchased a bagel, it wasn't fresh and hot out of the oven. Thus, toasting the bagel was common. However, as the 1960s began, technology began to change the nature of bagel bakeries, bringing them out of the cellars and onto street level. As she wrote, "For the bakery ‘bosses’ of the Bagel Bakers’ Association, the arrival of operations at street level was a business revelation. Consumers paid more than the retailer and could not get enough of the freshly baked hot bagel, something which had not been available in the days of wholesale. Blinking neon ‘HOT BAGELS’ signs were soon gracing the store windows of bakeries across the city." Nowadays, people may take for granted being able to buy a fresh, hot bagel but that wasn't always the case. Another bagel strike struck in February 1962. The Jewish Post (February 16, 1962) reported that 289 bagel bakers in New Jersey and New York went on strike, affecting 85% of New York City's bagel supply. The union wanted three week’s vacation with pay instead of two, fourteen holidays a year instead of eleven and wage increases. The F&M College Reporter (April 3, 1964--Illinois) perpetuated some of the common myths about the origins of bagels, stating they were invented in Vienna around 1683, a claim Ms. Balinska thoroughly refutes. The article goes into length concerning out bagel issues. For example, it states, "To the purist, there is only one true bagel. It is handmade from white wheat gluten flour, salt water, malt, and and yeast, and simmered in hot water for two minutes before it is baked. A few flakes of onion or garlic are grudgingly permitted as a sign of the times, but other varieties of the Bagel are considered rolls with holes in them and not Bagels." The article continues on the number of bagel bakeries in NYC, "In New York City, 36 bakeries turn out nothing but Bagels at the rate of a quarter million per day and three times that many on the weekends when 60% of all Bagel are sold." More information on the bagel's origins are found in the Jewish Post (July 3, 1964), especially concerning the term itself. "There is no Word in the German language Corresponding to the Yiddish word “baigle.” The root "baign” is derived from the German (to bend or to bow) in Yiddish "bogen.” But the formation "baigle” is purely Yiddish — which shows, of course, that Yiddish is a language by its own right and not a mere corrupted German. "Baigle” or "beigel” is the root “baign” or "beign” with the diminutive ending "1.” In German, if there were such a word, it would be "boegelein.” But there isn’t." A differing view comes from the Jewish Post (July 24, 1964), where is it mentioned that, "The bagel originally came from the province of Silesia where it was known as a "bcugel.” The Jews in their migrations picked it up, adopted it and carried it with them as they moved eastward." The Ohio Jewish Chronicle (September 17, 1965) published an article, mentioning how bagels were becoming more mainstream, and not just a Jewish delicacy. In 1964, Americans spent $15 Million for about 225 Million bagels. It is also noted that New York and its environs has 36 bagel bakeries, turning out about one million bagels weekly. There are 14 other bagel bakeries around the country, though their location is not mentioned. In addition, the article mentions some of the bagel types that are now available, including onion, egg, pumpernickel, whole wheat, raisin, and poppyseed. By the middle of the 1960s, bagel variety was spreading. The Jewish Post (November 5, 1965) noted that you could now buy frozen or even canned bagels. Plus, bagels came in several different varieties rather than just the traditional white and pumpernickel bagels. 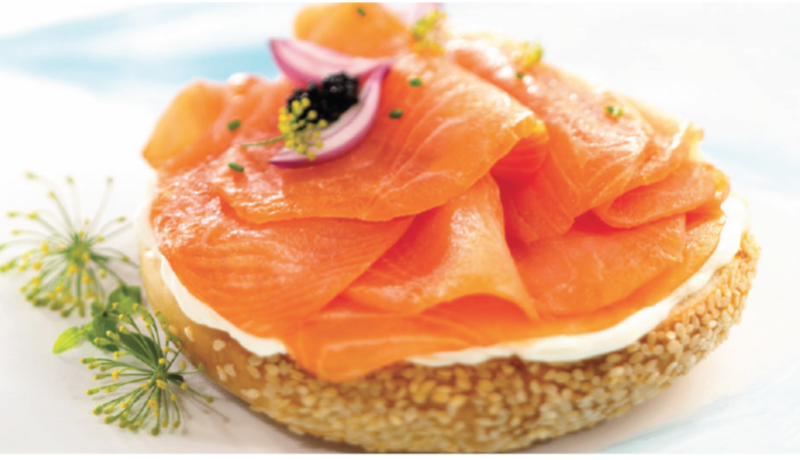 The article also included a number of bagel recipes from the "... home economics department of the country’s largest bakers of bagels, the New York Bagel Bakery,..." The recipes included Toasted Bagel Cheesies, Hamburgels (burger on a bagel), Sunshine Bagels, Cinnamon Circles, and Piquant Salmon Broil. Did you know that bagel burgers extended back this far? More variety is addressed in the Jewish Post (March 17, 1967), as it reported that, "In honor of St. Patrick’s day, Lender’s Bagel Bakery here baked bagels that were green. The package of frozen green bagel bore the slogan, ‘‘Erin go bragh, shalom” on the bag." This might have been the first time that Lender's made these green bagels, though it wouldn't be the last time. Though Miami had bagel bakeries for many years, the Jewish Post (February 9, 1968) reported that Atlanta, Georgia, finally opened a "bagel factory," the only one in the southeast, outside of Miami. Ever hear of bagels being referred to as "Bulls?" In The Bronxville Review Press & Reporter (March 6, 1969), there was a supermarket advertisement that stated, "Large JUMBO, handmade Bagels are called “Bulls" by New York’s Bagel Makers." The term "bulls" appears to be uncommon nowadays so most people are probably unaware of it. The Desert Sun (January 19, 1970) provided a recipe for a Pizza Bagel, "Take a frozen bagel; split it, butter it and top with a slice of mozzarella cheese, 2 tablespoons of tomato sauce, oregano, and a dot of butter. Broil 5 to 8 minutes, serve and eat and ciao!" A return to the Bagel Burger. In Synapse - The UCSF Student Newspaper (October 30, 1970), there was a restaurant advertisement, "FERDINAND'S Home of the BAGEL BURGER!!. 1/4 pound freshly-ground chuck char-broiled to perfection. Served with melted cheese on a genuine New York water bagel, topped with a ripe cherry tomato and complimented with favorite garnishes. All this and your choice of salad or fries for only 85c!" It is interesting that this California restaurant was buying New York bagels for this sandwich. More recipes for home cooks to make bagels also returned. In three issues of the Jewish Post (December 11, 1970), (December 25, 1970) and (January 15, 1971), they provided various recipes to make bagels at home, apparently spurred on my requests from their readers for such recipes. the Daily Illini (November 6, 1971) also offered their own version of a bagel recipe. In addition, the Desert Sun (January 16, 1974) provided a recipe to make Beer Bagels, though the recipe didn't specify any particular type of beer. Do any of you remember family members making their own bagels at home during the 1970s? What a wild ride through the history of water doughnuts! "In fact, women both sold and baked bagels: the bagel oven was also known as the vayberisher oyvn, or wives’ oven. It was an accepted way of making a living for women,.."
When you harvest grapes to make wine, the vines survive and will continue to provide grapes for years to come. On the other hand, mezcal is a distilled spirit made from the agave plant, more commonly called maguey in Mexico, and when it is harvested, the entire plant is gone. You need to plant another maguey to replace it, to maintain sustainability. This is a vital issue with the mezcal industry, one which has received growing attention in recent years. One of the mezcal producers which is at the forefront of this matter is Pierde Almas. Their website states: "Pierde Almas is first and foremost a Socially, Culturally and Environmentally Responsible Company." They also create some amazing Mezcals, some of my favorites, including the Maguey de Lumbre, +9 Botanicals, and the Mezcal de Conejo. In June, Pierde Almas will conduct their 9th Annual Agave Reforestation Program, where they help their Maestro Mezcaleros plant baby agaves in the wild hills of Oaxaca. Last year, the program, with volunteers from México, the U.S., and Europe, planted Tepextate, Tobaziche and Cirial Agaves in the foothills overlooking two different villages. Currently, 98% of those agaves are thriving. This year, they intend on planting Tepextate and Tobalá in San Baltazar Guelavila and San Luis del Rio, but will also plant about 200 Tepehuaje trees in each village. Tepehuaje trees, native to the Sierra Madre, are sturdy, fast-growing trees which have been a traditional source of firewood for centuries. Resource management is key to community prosperity, so we decided this year to insert one Tepehuaje for every 5 Agaves planted. As the trees grow a little faster than the agaves, they will be ready to be used as firewood when the agaves are ready to be harvested. Next year, their objective is to quadruple that amount. If you are interested in this fascinating project, there are two dates to choose from, June 8th and 15th. There is space on each date for a group of twenty people. Aeroméxico has generously provided discounted airfares for all participants. They have also partnered with Hotel Los Pilares to get discounted rates at their beautiful and historical hotel, located in the beautiful Jalatlaco neighborhood in Oaxaca’s Centro Historico. Pierde Almas will provide transportation to the fields, as well as a big lunch fiesta the day of the planting with Oaxacan music, great food and of course mezcal. If you are interested please send an email to reforestacion@pierdealmas.com and request more information. Space is limited and will fill up quickly so contact them ASAP if interested. Save the Maguey, Save the Mezcal! 1) On Friday, April 27, from 7pm–10pm, Chef Daniel Bruce and Chef de Cuisine Keith Bombaugh invite guests to a four-course Burgundy Wine Dinner at Meritage Restaurant + Wine Bar. They will present a four-course dinner paired with a variety of Burgundies from producers including Domaine Gracieux Chevalier, Domaine Michel Lafarge, Etienne Sauzet Vineyards, Domaine de Courcel, and Domaine Gros Frère et Soeur. Tickets can be purchased through Eventbrite for $190 per person. 2) CHOPPS American Bar and Grill and Executive Chef Steve Zimei invite guests to explore Italian wines with a special wine dinner on Friday, April 27, at 6:30pm. Guests will be transported to Italy for the evening, exploring Italian wine regions through a multi-course menu, presented by Executive Chef Steve Zimei. The evening features a reception with passed hors d'oeuvres followed by a three course menu with expert Italian wine pairings from Pio Cesare (Piedmont), Jermann (Friuli-Venezia Giulia), Renato Ratti (Piedmont), Argiano (Tuscany), and Il Poggione (Tuscany). Seats are available for $95 per person (inclusive of tax & gratuity). Space is limited and reservations are required. Call 781-221-6643 directly to book seats. A credit card is needed to secure a reservation. I've been to their wine dinners and they are excellent experiences, with ample delicious food and wine. I highly recommend you check out this wine dinner. Mezcal is the oldest distilled spirit in the Americas, thought to extend back nearly 500 years when Spaniards or Filipinos introduced distillation equipment to the country. There is also an intriguing theory, which still requires more supporting evidence, that the indigenous peoples of Mexico might have independently created their own distillation equipment long before the arrival of the Europeans. Nonetheless, the precursor to mezcal was a fermented spirit called Pulque, which was also made from the agave plant, and extends back over 1000 years. Thus, each sip of mezcal brings with it a sense of history, a connection to Mexico's past. At its simplest, mezcal is any distilled spirit made from the agave plant, which is more commonly called maguey in Mexico. Thus, mezcal is an expansive term, encompassing such agave distillates as Tequila, Bacanora, Racilla and others. You probably didn't know that tequila is really a type of mezcal. So how did tequila acquire its own identity? Let's explore some of the history of mezcal and tequila, primarily during the 18th and 19th centuries, and see the evolution. Some of this history will correct errors in the "commonly accepted knowledge" about tequila, and I've provided numerous sources to support my article. More research is certainly warranted, especially in some of the new avenues I've uncovered. Initially, there was just mezcal, and it lacked any sense of place. No matter where it was produced in Mexico, it was simply known as mezcal. At some point though, specific areas of Mexico became well known for the quality of their mezcal, and were referred to by reference to their area of production. This happened, at least in part, because that mezcal was being sold outside the area of its origin, and had acquired a certain reputation. It probably also cost more than other mezcal which wasn't known by its place of origin. Mezcal production in the area surrounding Tequila apparently began around the 1730s. According to Miguel Claudio Jiménez Vizcarra, the indigenous people of Amatitán, which is close to nine miles south of Tequila, were the first to distill mezcal in the area. Over time, mezcal production spread to the nearby areas, and the town of Tequila may have gotten involved in distillation around the 1760s. Unfortunately, Amatitán had significant water issues and as Tequila had an abundant source of water, it became the more popular area for production and distillation. Established as a Spanish naval base in 1768, the port of San Blas became especially important to the mezcal trade, especially when an eventual road connected Tequila with San Blas, helping tequila become more known outside of Mexico. San Blas became significant as a connection to Spanish settlements in California, a base for exploration of the northwest coast, and for mercantile traffic. All of the people that now worked at the port also became a new market for mezcal and other alcoholic beverages. In addition, the naval vessels commonly purchased those beverages for their lengthy treks, which also helped to spread knowledge of mezcal. Some of the earliest documented distilleries in the Tequila region are described in La construcción cultural y económica del tequila by Rogelio Luna Zamora (2015). There is a chart listing a number of known "tabernas" of mezcal-tequila in the 18th & early 19th centuries, noting the name of the distillery, owner, date of founding, and its location. The earliest is the San Martín de las cañas, founded in 1756, at the Hacienda de San Martín, though the name of the owner appears to be unknown. The next taberna was founded in 1758, by the Familia Cuervo y Montaño at the Hacienda de Cuisillos, though the name of the distillery is unknown. La Chorrera, founded in 1777, was owned by Malaquías Cuervo and located at the Rancho de San Juan de Dios de las Chorreras. In 1785, King Charles III officially banned the production of agave-based alcoholic beverages in Mexico, including pulque and mezcal, to protect the importation of Spanish wines and spirits. Despite its illegality, pulque and mezcal production continued. Like Prohibition in the U.S., people in Mexico still wanted these alcohols so some of them took the risk to make moonshine pulque and mezcal. The government's enforcement of this prohibition also wasn't too forceful, especially as they could earn money from its production. In José de Gálvez, Visitor-General of New Spain (1765-1771), by Herbert Ingram Priestly (1916), there is a passage about pulque which stated, “The viceroys would have gladly eradicated the evil, as would the clergy, but the beverage was an immemorial heritage of the indigines, and its use could not be prevented.” The government knew any prohibition would ultimately fail, so they were more practical, collecting their due. The book also mentioned, “Caldos, the term applied to entry duties collected on wines, brandies, and vinegar—to which were added, during the latter part of the 18th century, revenues derived from the manufacture in New Spain of spiritous liquors—produced in 1785-89 289,060 pesos; the cost of administering the revenue was 118,010, leaving 171,050 pesos for the term, or 34,210 pesos annual revenue net.” As can be seen, despite the ban, the government was still collecting duties on pulque and mescal that was manufactured. It is also during this period of prohibition that the first differentiation of mezcal by its place of origin can be found. In the Memorias de la Academia Mexicana de Historia (July-September 1958), there is an article titled Brevajes en la Colonia. La fontana mexicana del siglo XVIII en la mezcla de licores, written by M. Carrera Estampa. One of the passages in the article states, "En 1789 en el Real de Minas de San Pedro de Mazapil, en Zacatecas, se consumía mezcal procedente de Tequila con el nombre “Vino mezcal de Guadalajara”. Basically, this means that mezcal from Tequila had acquired the special name of "Vino mezcal de Guadalajara." Thus, at this time, it seems that mezcal from Tequila was being sold outside of the region, and was sought after because of its reputation. Finally, in 1795, after ten years of the prohibition, King Carlos IV overturned the ban on the production of agave spirits. It is this same year that an unnamed distillery was established by José Ma. Guadalupe de Cuervo at the Cofradía de Ánimas. As the prohibition had just been lifted, this distillery received the first official license to produce mezcal from Tequila. And this is the origin of the famous Cuervo distillery. As the 19th century began, new distilleries continued to open, and one of the most notable was La Antigua Cruz ("The Old Cross"), founded in 1805 by Jose Maria Castaneda in Tequila, said to be the oldest registered distillery in Tequila. Eventually, this distillery would become the Sauza Tequila distillery. Once Mexico acquired independence from Spain in 1821, the number of distilleries in Tequila increased even more, and the mezcal from Tequila started becoming well known and sought after for its quality. One of the earliest newspaper references to mezcal from Tequila in the 19th century is in El Sol (October 13, 1824), which stated, under "Announcements,": "En el meson de san Dimas calle de las Moras, se espende por mayor o menor vino mescal de Tequila legitimo; lo se que noticia al publico para su inteligencia." This refers to the "mescal wine of authentic Tequila," clearly setting it apart from normal mezcal. As this passage is plainly presented, without any further explanation, it seems that the average newspaper reader was already familiar with "authentic Tequila." This is even more interesting as by 1830, there were only about nine documented distilleries in Tequila. In Le Mexique (1830), J. C. Beltrami, an Italian author and explorer, detailed his journey to Mexico in 1823, including a visit to the area of Tequila. He wrote a single reference about mezcal, "Le maguey, par la grande quantite de sa liqueur, sert a former du pulque et de l'eau-de-vie, qu'on appelle Vino mescal." This roughly translates as, "The maguey, by the great quantity of its liquor, serves to form pulque and brandy, which is called Vino mescal." It would have been nice to have more detail here but it couldn't have impressed Beltrami sufficiently, for whatever reason. La construcción cultural y económica del tequila, by Rogelio Luna Zamora (2015), discussed how many small tequileros disappeared during the first half of the 19th century, but one of the most constant was the Hacienda de San Martín, which had been founded in 1756. By 1840, it "...was producing 400 barrels per week (66-liter barrels), which meant a distillation for that decade close to one million liters per year, if we consider that they worked 40 weeks a year. Probably in that decade, the production of tequila in the whole microregion reached two million liters per year." The growth of tequila during this time is impressive. This same article also noted that the distilleries of the town of Tequila produced about 55,000 barrels in 1835, with about one-third of that production being exported out of Jalisco. By 1843, the number of barrels being exported out of Jalisco was reduced down to about 3,700 barrels and in 1845, the amount had decreased even more, down to 1,692 barrels. These exports were primarily sent through the San Blas port. There were a couple additional newspapers references, over the next 35 years, differentiating mezcal from Tequila. In the El Monitor Republicano (July 11, 1849), there are lists of various shipments including separate references for "3 barriles mescal" and "3 barriles mescal Tequila," showing there was a difference with the mezcal of Tequila. A reference in El Universal (December 20, 1850) deals with taxes on cargo, stating ".., cada botija de vino mescal de Tequila o Pinos pagara seis granos;.." This roughly translates as ".., each botija of mescal wine of Tequila or Pinos will pay six grains;..." Once again, there is a specific reference to the mezcal of Tequila. Within Intoxicated Identities: Alcohol's Power in Mexican History and Culture by Tim Mitchell (2004), you'll find additional insight into how Tequila became more prominent in the middle of the 19th century. For example, "The patronal festivals and marketing fairs of other localities were key to achieving initial brand-name recognition for “Tequila.” In addition, "Jalisco had the good fortune to be the native region of a superior species of bluish-tinted agave (now known as Agave tequilana Weber)." Plus, pulque was still the most popular alcohol in Mexico so it was still being produced on a large scale across Mexico, except in the region of Tequila which chose to concentrate on producing tequila instead. With this burgeoning trade in the mezcal of Tequila, when was the first shipment to the U.S.? The Sauza Tequila distillery claims that they were the first, in 1873, to export tequila to the U.S. You'll find other sources making a similar about the Jose Cuervo distillery, that they too sent the first tequila to the U.S. in 1873. However, if you consult the Jose Cuervo website, you'll notice that the company alleges they shipped tequila to California, through the port of San Blas, in 1852, though the site doesn't provide any documentation to support this allegation. During my own research, I located documentation of a shipment in 1852 to California though unfortunately the reference does not indicate the source of the mezcal of "authentic Tequila." In the Daily Alta California, (July 22, 1852), there is a brief advertisement noting "Mescal--De Tequila Legitimo--1000 gals, ex, Ser.na. from San Blas, now landing at Sacramento street wharf, for sale by..." This could be the first "authentic tequila" shipment to the U.S. and it's certainly possible that it was sent by Cuervo, though the advertisement doesn't specify the producer. What other distillery at that time had the production capacity to ship 1,000 gallons, a substantial amount, to California? This documentation also disproves the claim that Sauza, in 1873, was the first tequila distillery to export to the U.S. In 1854, Ernest Vigneaux, a Frenchman, traveled to Mexico, became a prisoner of war for a short time, and left the country in 1855. He wrote about his experiences in Souvenirs d’un Prisonnier de Guerre au Mexique, 1854–1855 (Memories of a Prisoner of War in Mexico), and mentioned Tequila in a few passages. One of the key references is, "De meme que Cognac a donné son nom aux eaux-de-vie françaises en général, Tequila donné le sien à l'aguardiente mescal." This roughly translates as "Just as Cognac gave its name to French eau-de-vie (fruit brandy) in general, Tequila have its name to mescal." Ernest clearly noted the quality of the meszal from Tequila, considering it to be the pinnacle of mezcal production. Another important reference is found within the El Omnibus (January 8, 1855), which noted the price of a barrel of "vino de Tequila" at $20 (Mexican) though there wasn't a listed price, or even a mention, of "mezcal." This might be the first documented reference to "Tequila" on its own, without any reference to mezcal. Tequila was acquiring its own separate identity, though the process wasn't yet complete. In 1858, Don Cenobio Sauza journeyed to Tequila to visit a relative and decided to remain there, eventually getting a job at the tequila distillery of José Antonio Gómez Cuervo. In the Boletin de la Sociedad Mexicana de Geografia y Estadistica, there is a lengthy article, Memoria Sobre El Maguey Mexicano Y Sus Diversos Productos, written by D. Manuel Payno (August 1864). There are a couple references to Tequila, serving to differentiate it from other mezcal. First, you'll find: "El vino mezcal se elabora en grande escala en Guadalajara y San Luis Potosí. El de Guadalajara conocido generalmente con el nombre de tequila, se consume en todo el pais." This passage notes that the mezcal of Guadalajara is generally known as "tequila." Second, you'll find: "El mezcal puro es uno de los licores espirituosos, mas estimados en el merca do de México. Este licor y el tequila que se fabrica en el Departamento de Jalisco, suelen confundirse en el olor y en el sabor, con el ginebra de Holanda." That roughly translates as "Pure mezcal is one of the most spirited liqueurs, most prized in the Mexican market. This liquor and the tequila that is manufactured in the Department of Jalisco, are often confused in the smell and flavor, with the gin of Holland." In The Evening Telegraph (September 1, 1868-Philadelphia), there is an interesting article, A Marvelous Plant, which discusses the myriad uses of the maguey plant, noting: "No account of Mexico can well omit a notice of its common vegetable wonder, the maguey." The article later states: "From the maguey verdi come the mescal and tequila, one a winish alcohol, and the other a gin, made in Jalisco and Guadalajara." There is a clear separation here between mezcal and tequila, with a rather significant difference in style. The Chicago Tribune (December 18, 1870) notes: "There is a superior variety of the mescal produced near Guadalajara, and called after the village in which it is made, "Tequila." This costs more, and is sent to the City of Mexico, and elsewhere, as something very choice for a present to one's friends." Again, Tequila has its own identity, and is seen as a higher quality drink as compared to normal mezcal. The Weekly Arizona Miner (July 13, 1872) also printed an interesting article about the maguey plant. The article mentions that common Mezcal usually sells for about 6 1/4 cents per bottle, but "...certain localities produce favorite brands which bring larger prices than the ordinary article,..." Though Tequila isn't specifically mentioned, its prior mentions would seem indicate this passage would be applicable. Some intriguing statistics were mentioned in Out West (August 22, 1872, Colorado), publishing that the "Tequila District"has a population of about 60,000 people, and that 25,000 of them are "... engaged in raising and manufacturing whiskey from the mescal or century plant;.." Besides the error of equating whiskey to mescal, it is amazing that over 40% of the population was involved in the mescal industry. This industry produced about 3000 tons, or 3000-4000 barrels, annually. When we consider that 20 years before, 1000 gallons were exported to California, that is comparably a huge amount considering production levels at this point. In 1873, Don Cenobio Sauza decided to head out on his own, purchasing a tequila distillery, the former La Antigua Cruz. He renamed the distillery La Perseverancia and it became the foundation of the Sauza empire. At this time, Don Sauza also allegedly began shipping tequila to the U.S., though, and despite his claims, he was not the first to do so. The El Padre Cobos (November 2, 1873), and a number of other issues during the next few months, posted an ad: "Gran Lecheria! En la calle de la Alcaiceria entre los numeros 27 y 28 se vende leche pura garantizada desde las cinco de la manana adelante y chocolate superior de varias clases, al estilo de Guadalajara. Proximamente se recibera de esa ciudad un abudante surtido de vino de Pechuga febrido in Tequila, Frijol garbancillo y Cigarros de la Conchita y el Buen Gusto todo legitimo y a precios comodos." This ad is fascinating as it may be the first mention of "Vino de Pechuga" being made in Tequila. The El Libreto (January 4, 1875) also ran an advertisement for "... del Pechuga legitimo y Tequila puro de la mejor clase." This ad mentions "pure" Tequila of the best kind, and it clearly discusses Tequila on its own, and not just as mezcal. In the Pacific Rural Press (April 7, 1877), there is a passage, "The city of Tequila is the great manufactory of the universal drink distilled from the maguey plant, which in this locality seems to be the best in Mexico. Nearly the whole city is made up of distilleries, and long before you enter its precincts you can smell the fumes of this horrid liquor. Vast fortunes have been realized by those engaged in its manufacture." We see that Tequila is once again is said to be the best in Mexico, that much of the city is dedicated to Tequila production, and that it has earned some people significant income. How much Tequila was being produced at this point? In La construcción cultural y económica del tequila, by Rogelio Luna Zamora (2015), there is reference to a Treasury Report from 1877-1878, offered a comparison of mescal and tequila, in regards to number of barrels, number of liters and value. In 1878, tequila production consisted of about 98,000 barrels, comprising 6.4 million liters and valued at $1.17 Million. On the other hand, mescal production consisted of about 56,000 barrels, comprising 3.7 million liters and valued at $570,000. As tequila production was almost twice that of mescal, it is another reason why tequila became so prominent during this century. The La Patria (February 1, 1879) ran an advertisement from a seller, Nicolas Andrade, of Tequila and Pechuga. The ad lists the prices, in Mexican dollars, for various containers, from a cup to a barrel. It is interesting to see that Pechuga generally cost twice as much as Tequila. A cup of "Grande Tequila" costs $0.03 while a cup of Pechuga cost $0.06. A bottle of Tequila cost $0.37 while a bottle of Pechuga cost $1.00. A Jar of Tequila cost $3.50 while a Jar of Pechuga cost $7.00. A Barrel of Tequila cost $25. As earlier mentioned, a barrel of Tequila in 1855 cost $20, so the price didn't rise significantly over the course of 24 years. More prices were provided by the El Municipio Libre (April 3, 1879), in an advertisement by a liquor store. Mescal de Tierra Caliente cost $1.50 for a bottle and $20.00 for a Box (though there is no indication how much the box contains). Tequila Superior cost $3.00 for a bottle and $40.00 for a Box. These prices are higher than the other advertisement. The Sun (May 2, 1880-New York) wrote "At Tequila, a little town in the State of Jalisco to the north of Guadalajara, a very superior kind of mezcal is manufactured, which takes its name from the town, and is really a palatable beverage." We once again see that the mezcal from Tequila has continued to take on its own identity, being known simply at "Tequila." In the Los Angeles Herald (April 25, 1882), one of their articles stated, "Mescal of Tequila, the popular beverage of the Mexicans, and now so highly appreciated by Americans, can be had only at Guerrero's, corner Upper Main and Marchessault streets." It is interesting to see that Tequila is now considered popular in the U.S. The New-York Tribune (November 28, 1884) printed, in an article about pulque, that, "It is said that one can get "deader" drunk, and remain so longer, on a smaller quantity of tequila than any other known liquid, although it is as colorless as water and almost as tasteless." For some, tequila has a bad reputation, though we can't deny the possibility that some of this negativity may have also been due to racism. The Wichita Daily Eagle (April 24, 1886) paints a better picture of tequila, noting: "Briefly, this wonderful flower of Mexico is then made into a sort of whisky, called tequila--pronounced te-hee-la. This tequila is rather a hot and pepperish drink, but physicians advise strangers to drink it in preference to either the whisky or brandy to be bought in Mexico. The after-effects, as compared to other drinks, are said to be nil." In the 1887 edition of The Mexican Guide by Thomas A. Janvier, which appears to be a travel guide of sorts, it mentions that “A strong distilled spirit is made from the root of the maguey, the best variety of which is the tequila de pechuga. It has something the taste of Scotch whiskey. It costs seventy-five cents a bottle.” This is a reference to Pechuga being the highest quality type of tequila and it even provides a price for it at this time, a mere seventy-five cents. The Indianapolis Journal (April 03, 1887) printed an article that was also very negative toward Tequila, noting: "Tequila, unless first diluted, is a fearful liquid to take into the stomach. It is, however, probably not so injurious as bad whisky, being, in the language of the patent pill advertisements, "purely vegetable", and not doctored with drugs and fusel-oil." The article then continues: "It is not pleasant in taste to the beginner, and stays with the drinker entirely to closely and much too long in the the matters of odor and bad after-effects. It is difficult to determine what a man will not use as a stimulant, but certainly tequila--with a flavor of salty gin--is not a beverage which anyone whose taste is not perverted would "hanker" after." Again though, Tequila stands on its own, separate from mezcal. According to Intoxicated Identities: Alcohol's Power in Mexican History and Culture by Tim Mitchell (2004), the construction of the Mexican railroad system, especially the completion of the Guadalajara to Mexico City line in 1888, create a boom for tequila producers. In 1889, ".., the tequila tycoons of Jalisco had already shipped 238, 458 liters of their precious mezcal to the nation’s capital." This negativity continued in the Barton County Democrat (November 14, 1889, Kansas), where their article stated: "...tequila, a most atrocious drink, which looks like gin, harmless enough to all appearances, but which goes down your throat like a wave of fire, and a few glasses of which will make you drunk clear to your fingertips." The article also stated: "This liquid leaves a delicate suggestion of tar and red pepper in your mouth, and, if drunk after eating a certain kind of domestic fruit, it is very dangerous, and in many cases results very disastrously for the imbiber." In The Morning Call (May 18, 1891, San Francisco), there are some interesting items, such as: "The City of Mexico drinks 250,000 pints of pulque daily, or a pint per capita, which ratio prevails generally throughout Mexico, pulque being the national beverage, ..." The article then goes on: "Mescal distilleries are very simple and more secret than a moonshiner's still." It also provides some additional information on pricing, with: "In Arizona for twenty-five years past mescal has averaged $2.50 gallon new with $1 added for each year of maturity. A higher grade article is called tequila and is worth over $10 per gallon." This article indicates that mescal and tequila have been imported into Arizona since about 1866, which predates Sauza's claim to being the first to export tequila into the U.S. in 1873, but is later than the 1952 shipment of tequila to California. The price of tequila, in U.S. dollars, is over four times higher than that of ordinary mezcal. You can find additional prices for Mezcal in the Boletín de Agricultura Minería e Industrias (January 1, 1892). A barrel of "Mezcal Tequila, buena clase" is priced from $10.75-$11 (Mexican) and a barrel of "Mezcal Tequila, doble o de punta" (double or pointed) from $18-$20 (Mexican). The passage doesn't explain what is meant by "double or pointed." In El Fronterizo (March 19, 1892-Arizona), there is some information on the amount of tequila being produced. The newspaper writes, "Ferrocarril proyectado en Jalisco. se habla muy seriamente en guadalajara de un proyecto de Ferrocarril de guadalajara a Tequila, pueblo que esta a 64 kilometros de distancia y en el cual se fabrican cosa de 200 barriles de tequila diarios. Se calcula que ademas de esta carga se trasportaria muchismo grano de las haciendas que hay por alli." The passage discusses a railway project which is intended to unite Tequila to Guadalajara, noting that Tequila produces about 200 barrels each day. The Wood County Reporter (August 27, 1896, Wisconsin) has an article, Vintages of Mexico, which discusses pulque, mezcal and tequila. It begins, "The special drinks of Mexico are pulque, mescal, and tequila." That shows that at this time, mescal and tequila are considered separate entities. "As far as the alcoholic strength of the tequila is concerned, the same is about equal to that of common whisky, and likewise in its effects. If taken moderately, however, in case of poor appetite, a few thimblefuls act as an excellent tonic, and a small dose taken before retiring at night has a quieting effect. It is not advisable for a person to take much tequila and he who takes none at all is still better off." The Norfolk Virginian (November 05, 1896) states: "The sum raised by the government of Mexico from the manufacture of tequila, one of the native intoxicants, is about $500,000 annually." This is an interesting statistic, touching on the size of the tequila industry at this time, and would be the equivalent today of about $13.8 million. The Grenada Sentinel (April 17, 1897-Mississippi) published an article on Maguey, and mentioned tequila, and its effect on the drinker. "Pulque produces an exhilaration, but not a drunk; mescal brings out the ruling passion in a man to a limited extent according to the quantity imbibed; tequila transforms the drinkers' surroundings into a purgatory or paradise, as his conscience most naturally pictures:.."
The Scranton Tribune (May 08, 1897) published an article about Mexico stating, "Tequila and mescal are distillations from different varieties of the maguey, the heart of the plant being roasted before it is distilled. These liquors are heavy and for the most part vile. It is said that a very small quantity of mescal has been known to cause a large sized revolution in days gone by." Another negative comment on Mexico's spirits. As to tequila's alleged potency, the Rock Island Argus (May 29, 1897, Illinois) provides a humorous comment, stating tequila is "... a brandy, and three swallows of it will make a man go home and steal his own trousers." The El Paso Daily Herald (April 7, 1899) provided some intriguing information on "Mexican Agriculture" for the year 1897. This was the first time an official document had been compiled. There were 3,101 haciendas in Mexico, with 279 being for pulque and 134 for mezcal. Tequila is not specifically mentioned in this figure so it may possibly have been included in the mezcal number. Other figures mention the number of hectoliters and the value of various alcoholic beverages, including pulque (about 2.6 million hectoliters & $4.9 million in value) and mescal & tequila (about 399,000 hectoliters & $4.1 million in value). First, we can see that although much more pulque is produced than mezcal & tequila, it is much less expensive, so that the values are much closer. A hectoliter is equivalent to one hundred liters. Thus, the amount of mezcal & tequila comprised 39,900,000 liters, the equivalent of 4.4 million cases of 750ml bottles. The report also stated that "... the people of Mexico consumed 50 liters of alcoholic stimulants per capita in the year 1897, and spent per person $1.30 for their drink." The Weekly Pantagraph (July 28, 1899-Illinois) published an article about the maguey plant. It also mentions that, "Tequila is an alcoholic liquor, used both for medicinal purposes and as a beverage." It continues, "Unlike pulque, tequila is a perfectly clear liquid, and improves in strength and quality with age. The profits and revenues derived from this product, while somewhat less than that of pulque, are still very large." The article also states, "The largest tequila distilleries are located at the town of Tequila, eighteen miles northwest of Guadalajara, each of which establishments pays the government a monthly tax of $500 for the privilege of manufacturing the spirits." By 1892, there were 47 distilleries operating in the state of Jalisco, 13 of them in Tequila itself. The future for the next century looked bright. Tequila had its own separate identity from mezcal and it seemed that it would continue to gain converts in the U.S.
Last Tuesday evening, I enjoyed one of my favorite desserts, Bread Pudding with a salty caramel sauce, created by Chef Marisa Iocco at Spiga in Needham. The first spoonful was pure bliss and I have to admit that I might have let out a soft moan of pleasure. Every subsequent spoonful was absolutely delicious, a hedonistic treat which I cannot recommend enough. I first tasted Chef Iocco's bread pudding back in 2009, and it captivated me then, being just as delicious now as it was all those years ago. I've joked before, recommending you start your meal with the bread pudding, just in case you are otherwise too full to eat it after your dinner. I certainly wouldn't hold it against you though if you actually did order the bread pudding first. So why don't we have a local bakery that specializes in bread pudding? Cupcakes have already had their time in the spotlight. It's time for something else, another dessert to take the world by storm. My vote for a replacement goes to Bread Pudding. It is a perfect comfort food, and is versatile so that you can create many different flavored bread puddings. I've been asking for this for the last five years, hoping some adventurous entrepreneur would go forward with this idea. There is a bread pudding bakery in California, Schulzie's Bread Pudding, and they advertise 108 flavors, broken down into Classics, Chocolates, Fruits and Seasonal. 108 flavors! Why can't such a bakery start up in the Boston area? They don't even have to half the number of flavors as Schulzie's. If the quality of the bread pudding is good enough, I'm sure you'll get enough customers. 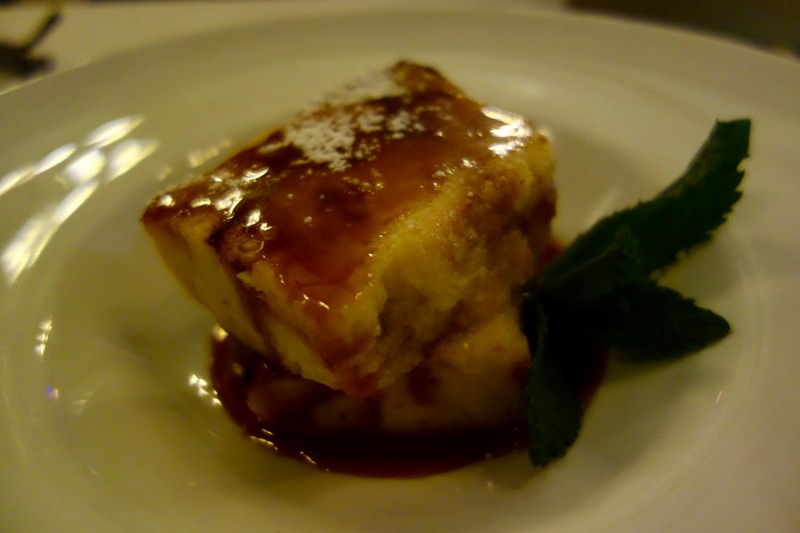 Chef's Iocco's bread pudding has been famous for many years. So, let's have someone step up and start a bread pudding bakery! Readers, would you support a local bakery specializing in bread pudding? What local restaurants have you enjoyed bread pudding? Do you make bread pudding at home? From the outside, Classic Pizza, on Ferry Street in Malden, looks like a typical pizza joint, nothing to differentiate it from many similar places. Like me, you might drive by it dozens of times without paying any attention to it. However, a couple friends of mine, Kathryn and Matt, recently recommended this spot to me, telling me something that makes this place more unique. They also serve Indian cuisine! Classic Pizza serves much of the usual fare, pizza and subs, pasta and seafood, chicken fingers to wraps. However, they also have a small menu of Indian cuisine, much of it vegetarian. The new owners of the restaurant wanted to do something to make their place different and they chose to add some Indian specialties. The items are made fresh so they need to keep the menu relatively small, unlike some restaurants with huge menus that need to use frozen sauces and such. You'll find Paneer Pakora, Aloo Tikki, Chanaa Masala, Vegetable Biryani, Naan, and more. Kathryn and Matt raved about the taste of this Indian cuisine so I had to visit the restaurant myself, to sample the food. Yesterday, as I had other business in Malden, I decided to stop by Classic Pizza to grab some lunch. 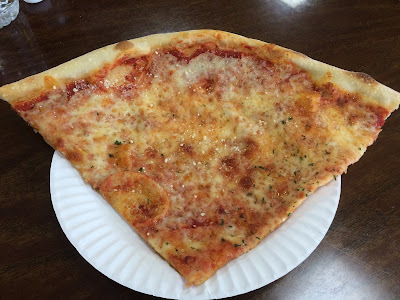 I had to start with a slice of pizza, and they give you quite a large slice, about the size of two slices in many other pizza joints. It has a nice thin crust and a good taste. If you just want a big slice of pizza, this is a good option. It's the Indian cuisine though which is the standout. I opted for the Chicken Tikka Masala ($12.95), which is accompanied by rice and a little salad. As I love the various Indian breads, I also ordered the Garlic Naan ($2.50). They asked what spice level I wanted for the Chicken and I chose the Medium spice. This dish is prepared fresh so it takes a short time to be readied, and is well worth the short wait. The Garlic Naan, served hot, was delicious, with a nice soft texture, and plenty of garlic. Perfect for dipping into the sauce, and I ordered a second garlic naan because it was so tasty. A tall tower of rice, cooked perfectly, and an excellent bed for the chicken and sauce. The Chicken Tikka Masala possessed an excellent depth of flavor, complex and absolutely delicious. Savory and spicy, it brought a delightful, but not overpowering, burn to my mouth. The chicken pieces were tender and there were plenty of them within the sauce. I didn't finish all of the sauce, but got it to go so I can use it later at home. A high quality dish, it earns my strong recommendation. I'll certainly be returning to Classic Pizza soon, to try more of the Indian cuisine. This restaurant deserves more attention, and maybe they should highlight their Indian cuisine on the front of the restaurant, to motivate more people to stop by. For now, it remains more of a secret, though I'm letting the cat out of the bag. 1) Puritan & Co. Chef/Owner Will Gilson, Wine Director Peter Nelson and the restaurant’s talented team welcome Oregonian winemaker Chad Stock as their guest of honor at a winemaker dinner on Thursday, May 3rd, at 6:30 p.m.
A top winemaker of and authority on Oregon wines, Chad will provide guests with an excellent introduction to the state’s wines beyond the ubiquitous Pinot Noir and the status quo of conventional winemaking. Along with complementary dishes prepared by Chef Will Gilson and conversation about Oregon wine varietals, Chad will be pouring tastes of a variety of wines produced by the three Oregonian wineries where he works. Tickets cost $95 and can be purchased here: Eventbrite. Due to the limited number of seats, Puritan and Co. requires a $30 deposit per person. Puritan and Co. will call to confirm attendance on Saturday, April 23. If the reservation is cancelled after that time, and the space is not able to be reserved, a Puritan & Co. gift certificate will be issued in the amount of the deposit. 2) On Tuesday, May 1, at 6:3opm, Legal Harborside will host a four-plus-course wine dinner with selections from the acclaimed Knights Valley family retreat, Peter Michael Winery. The evening’s pours will be chosen by Peter Michael, a driven entrepreneur whose passion for winemaking began at his father’s side in Bordeaux and Burgundy. The dream of having his own vineyard came to realization in 1982 when he caught eye of the 630 acres of volcanic ridges and creeks on the western face of Mount St. Helena in Knights Valley, today known as the Peter Michael Winery. Drawing inspiration from the wineries of Burgundy and Bordeaux, the Peter Michael vision is to perfect terroir-driven wines exclusive to the Cabernet, Pino Noir, Sauvignon Blanc and Chardonnay families. 3) The team at Loco Taqueria & Oyster Bar is growing and they have just appointed inaugural Chef de Cuisine Jacob Mendros. Together with Executive Chef Matt Drummond, they have added over a dozen new menu items at this funky neighborhood taco joint. Chef de Cuisine Jacob Mendros most recently opened Explorateur and prior to that was in the kitchen at L’Espalier. Jacob has fully embraced the bold flavors of regional Mexican cuisine and the endless summer vibe of Loco while revamping the menu. Tacos are now available individually and some of the new items are: Oaxacan Quesadilla (a mildly tweaked version of a very classic dish from Oaxaca on a corn tortilla with blossoms, avocado bisque and queso Oaxaca), Fluke Crudo (herb jus, grapefruit soda, nori, horseradish and orange and black corn chips - although not necessarily traditional in Mexican flavors, it is light and earthy), Burrata (salsa verde-pesto, farm greens, shaved radish and onion, warm corn tortilla), Maine Mussels (rosé, serranos, radish and sour cream), Eggplant Al Pastor Taco (charred pineapple, crispy onion, shaved serrano & scallions), Asparagus Taco (green tortilla, fried cotija, buttermilk caramel, coriander), Burnt Ends Taco (guacamole, apple & red onion slaw, Carolina bbq), Ronnie Mac’s Taquitos (ground beef, Monterey jack, iceberg, Spanish onion, sesame seeds, Ronnie’s sauce), Chicharon Guacamole (roasted poblano, chicharron chips), Crab Guacamole (lump meat, chopped mango, blue corn chips) and Warm Wheat Berries salad (farm greens, roasted broccoli, cotija, egg yolk, cilantro & pepita pesto). The menu at Loco remains predominantly gluten free, with the exception of 4 out of 35 of menu items. 4) The Babbo Pizzeria e Enoteca and the Corey C. Griffin NHL Pro-Am invite guests to dine out for a cause this April. Throughout the month of April, Babbo will be serving up a special edition Buff Chick Pizza to raise funds for Boston Children's Hospital. Created in partnership with the Corey C. Griffin NHL Pro-Am, $5 from every Buff Chick sold at Babbo from April 2nd to April 30th, will be donated directly to the the Pro-Am's fundraising efforts supporting Boston Children's Hospital's Pediatric Head Trauma Unit. Established in memory of lifelong hockey fan and player, Corey Griffin, The Corey C. Griffin NHL Alumni Pro-Am brings together NHL greats for an annual hockey tournament, which raises money to support the care and research of pediatric head trauma at the Boston Children’s Hospital Pediatric Head Trauma Unit. Contributing to the $2,500,000 already raised by the tournament, Babbo's Buff Chick pizza was inspired by Corey's favorite childhood sandwich he would regularly order alongside longtime friend and co-founder of The Corey C. Griffin NHL Alumni Pro-Am, Anthony Aiello.